The 10k run is for runners only, competitive or recreational. Walkers, strollers and baby joggers are NOT allowed. It is a BC Athletics certified course BC-2014-034-BDC making it attractive for competitors seeking a personal best time or 10k certification. For the recreational runner, it is fun and scenic. 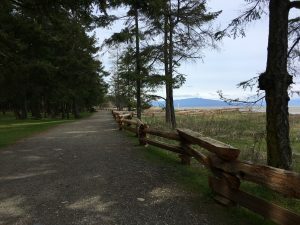 The course surface is road and groomed trails through the Rathrevor Beach Provincial Park. Awards will be presented to the first three finishers in 5 year age categories. Takes place in the Parksville Curling Club at Parksville Community Park from 8:00am – 9:30am. Race numbers not picked up by the commencement of the event are forfeited and regarded as a charity donation. Race Start is in the Pioneer Crescent cul-de-sac, a short walk from the Parksville Curling Club. Both courses will be closed at 11:30am. Marshals and water stations will not be available after 11:30am. Post race refreshments are provided for registered participants. Awards will start at approximately 12:00 noon with many draw prizes to be given away during the presentations, including the grand prize draw at the end. Only participants who are present are eligible to receive draw prizes.